Shaykha Tamara Gray is the founder of Rabata, an organization dedicated to promoting positive cultural change through creative educational experiences. 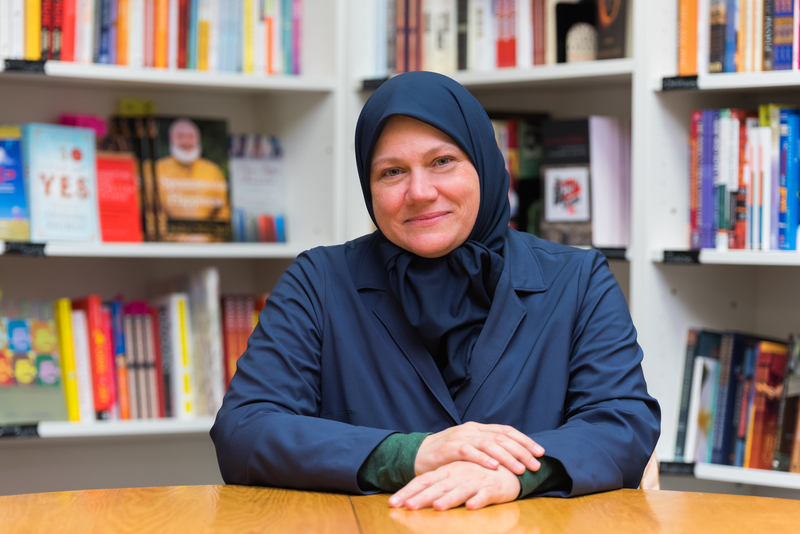 She is an Islamic scholar and holds multiple ijazas in Islamic sacred texts and subject matters. Shaykha Tamara is a doctoral student in the Leadership, Policy and Administration program at the University of St. Thomas in St. Paul, MN. She holds a master’s degree in Curriculum Theory and Instruction, and worked for twenty-five years in the field of education, before moving into the non-profit world. Shaykha Tamara works as Executive Director for Rabata, building and sustaining its many and varied educational projects. Some of the projects of Rabata are: the Ribaat Academic Program; and online seminary for Muslim women, Daybreak Press publishing, Daybreak Bookshop and Community Gathering Space, Leadership and Legacy Curriculum Materials, etc.. She is also a community faculty member at Metropolitan State University in the Ethics and Religious Studies department, and Associate Chaplain at the University of St. Thomas. Shaykha Tamara is also a public speaker, often engaged to speak about issues of gender, leadership, Islam, and spirituality; locally, nationally and globally. Some of her platforms have included, the International Leadership Association, the World Parliament of Religions, the Bonyaan conference on the Muslim woman (Sweden), the Islamic Society of North America and several universities, including Princeton, Virginia Tech and Oxford University. Her publications range from several culturally appropriate English language curriculum programs to translations of sacred texts. Shaykha Tamara’s most recent work is the translation of Mukhtasir al-Jami’ fi al-Sīra al-Nabawiyya by Samīra Zayid [Compendium of the Collection of Sources on al-Sīra al-Nabawiyya] (Co-translator) scheduled for release in Fall 2017. Her book, Joy Jots: Exercises for a Happy Heart, is in its third print. Shaykha Tamara is part of the ISNA task force for more inclusive and welcoming mosques, on the advisory board of Muslim Women’s Association of Chicago, and the Muslim Anti-Racism Committee. She also sits on the board of Sakana Community Resource, working with faith based financial tools and affordable housing, and on the board of the Collegeville Instititute’s Interreligious Fellows Program, working to develop educational programming for faith leaders around social justice issues.